I have many captures of the endemic Philippine Duck in flight, but this one should be my favorite. I just like the way the wings were frozen in the full downstroke position, and the angle of light was just right to show the iridescence of the speculum * well. That herons and egrets can fly is not too impressive to me – their large wing area and light slender bodies allow them to soar even in the slightest wind. Duck flight is a different matter though. Beneath the streamlined curves of the duck’s body, there are hints of powerful flight muscles that enable this relatively heavy bird to get to the air even with stubby wings. 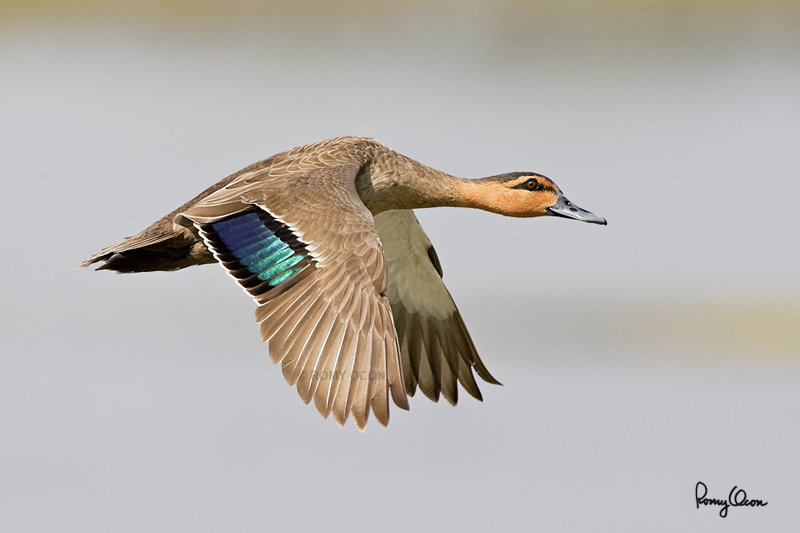 Quackers fly by sheer muscle power, and when they come in to land on the pond water (belly-flop, actually), they drop almost like a rock as soon as their wingbeats slow down. This frame came from the middle of a burst of over half a dozen shots, most in good focus and each shows a different wing position. The background was out-of-focus pond water with some vegetation. Amazing what modern autofocus technology and fast frame rates can do at birds-in-flight photography. Habitat – Freshwater marshes, shallow lakes and ricefields. Shooting Info - Candaba wetlands, Pampanga, Philippines, April 3, 2007, Canon 1D MII + EF 500 f4 IS + Canon 1.4x TC II, f/7.1, ISO 320, 1/1600 sec, 475B/3421 support, near full frame, manual exposure in available light. Video clips of the Philippine Duck.